The Véhicule Press Blog has posted a short extract from Jeremy Noel-Tod’s upcoming book of criticism The Whitsun Wedding Video: A Journey into British Poetry that’s woven a snarling thread on Facebook where it was shared. It’s a thread I don’t want to get caught up in, as what concerns me, the extract’s main rhetorical ploy, comparing William Cowper’s reputation to Seamus Heaney’s, has so far gone unreflected, and to remark the ironic ahistoricism of Noel-Tod’s gesture requires more space than a Facebook comment thread. Paul Vermeersch writes these two sentences in a passing response to “The Persistence of the Resistance to Theory”. The distinction that troubles him between “writing [and] some of the other disciplines” may be accounted for by some arts being more mediate than writing. Music, painting, filmmaking, photography, and sculpture, for that matter, all demand acquaintance with an instrument: obviously in the case of music; brush, pigments, palette and other implements in the case of painting; and so on. Writing, however, appears to the layperson to require only literacy or in the case of oral language arts even only the voice. It might be objected singing and dancing are as immediate as the voice and body, but both seem special occasions of each, speaking and writing more basic, as thinking, the dialogue of the soul with itself or what one attempts to merely attend in meditation, appears to intimate. Of course the writer and writing teacher beg to differ: the poem or story are not just thinking or talking; creative writing is an art or craft where language is the medium worked. No matter how spontaneous or plain spoken a poem, say, may appear—and even if it is in fact spontaneous or improvised—its language is organized in an artificial manner. The very words “creative writing workshop” imply—and its practice is premised upon the assumption—that creative writing is a teachable, learnable craft. If the master is to teach the apprentice, they must share a metalanguage, a discourse that articulates the materials and practices of that art and that expresses value judgments. This discourse may be called a “poetics”, not of the theoretical kind typified by Aristotle’s Poetics—a description, analysis, and evaluation of the art by a non-practitioner—but more akin to Horace’s Ars Poetica, practical guidance of an acknowledged master offered to an aspiring neophyte. Ironically, while creative writing teachers will vehemently defend the artificiality of literary language, too often (in my experience, at least) they assume the language of their poetics is somehow natural and its value system intuitive. Worse, too often, precisely because the terms of their poetics is assumed to be natural, they assume it is as unproblematically shared with the apprentice. Despite the distinction between theoretical and practical poetics, the practical language of the workshop is heavily indebted to the theoretical language of the English class, i.e., literary criticism. Of course, the corollary is also true: the language of the master informs that of the teacher: the poetics of Horace, Wordsworth, Coleridge, or Henry James are fed back in to the merely scholarly study of literature. But creators learn their terms in the classroom. Neither scholarly nor creative discourse can claim priority; they are mixed at the source, because the art of writing assumes what the ancients called grammar, literacy, and one’s taught reading and writing in school. Not only are the languages of criticism and creation impossible to disentwine, they are also diverse and relative. The notion of poetry as craft was energetically applied by the Russian Futurists before the Great War, for example, with their doctrine of “the self-sufficient word” and their emulation of the factory worker or craftsman, an approach summed up neatly by the painter Dmitriev: “the artist is now simply a constructor and technician.” Their poetic, as articulated by their scholarly co-workers the Russian Formalist critics, spoke of “materials” and “devices” with a dispassionate, scientific technicality and precision that makes the terminology of most criticism or poetics seem quaint. This approach to the craft of poetry finds analogues in anglophone poetics, in the “bald statement” William Carlos Williams makes in his introduction to The Wedge (1944), “A poem is a small (or large) machine made of words,” and in creative writing pedagogy where the Russian Formalist concepts of “defamiliarization” and “device” are used alongside exercises in proceduralist composition in the manner of the OULIPO or present-day Conceptualism. That such poetics also find inspiration and conceptual resources in literary theory should not go unremarked. Regardless of the impossibility of a purely practical poetics, the knotiness of poetics, criticism, and theory being snarled together, or debates about the merits of competing creative writing pedagogies, doubts remain whether writing can be taught. Such skepticism cannot be dismissed as easily as pointing out it depends upon an outmoded, questionable notion of genius. Who can deny that the increasing plethora of creative writing programs results in an increasing homogenization of literary practice? My own experience is telling: every year I teach the latest Journey Prize Stories and invariably I find the creative-writing-school-trained jury members award first prize to the story worthy an A+ in a creative writing class while the edgy, lively work, worthy an A for Art, is overlooked, precisely because of the prejudices inculcated in the course of the jurors’ educations. What can be taught is technique, but technique without the natural gift of talent is merely mechanical or at best competent. The art of writing (or music, or painting, etc.) can be taught, but not what might make it Art. One splash Alice Munro’s winning this year’s Nobel Prize for literature made stirred a teapot tempest in the Twitterverse, proving again, if any further evidence were called for, just how anathema Twitter is to thought. To wit, Brett Easton Ellis tweeted “Alice Munro is so completely overrated,” then expanded on his judgement an hour later: “Alice Munro was always an overrated writer and now that she’s won The Nobel she always will be. The Nobel is a joke and has been for ages….” The cacophonous reaction was as swift, overwhelming, and damning as it was puerile. First, I unreservedly applaud Munro’s winning the prize and the well-deserved attention the award will bring to her oeuvre. What interests me is why Ellis, given the kind of prose he writes, might be moved to remark what he does about the regard given Munro’s writing and the character of the Nobel Prize. Munro… has been called Canada’s Chekhov. Similar to the work of the Russian short-story master, plot is usually secondary. Munro’s stories focus on striking portraits of women living in small-town Ontario. They revolve around small epiphanies encountered by her characters, often when current events illuminate something that happened in the past. Munro’s stories are praised for focussing on character more than plot, on her characters’ “universality, their humanity.” The universal humanity of these characters is revealed in their experiencing “epiphanies” that illuminate their and by virtue of their universality our little slices of shared life. The critical idiom here is hardly as spontaneously universal as Munro’s characters’ epiphanies. Rather, it’s the discourse of a conservative, humanist, classicist aesthetic, the same operative, for example, in Yeats’ and Eliot’s being awarded the prize (despite their respective dalliances with fascism and antisemitism) but not Joyce. The drama and prose of the late Thomas Bernhard remain second to none in their stylistic bravura and social and existential profundity, but they would never have been considered for the prize precisely because of their obsessive style, pitiless intelligence, and relentless truthtelling. Examples could be multiplied. who amazed his audiences in the early 1880s. He was particularly interested in the absurd, and repatterned the anecdote and vignette forms of the popular press into innovative forms of writing: pieces in the guise of National Census questions, a test set by a mad mathematician, a proposal to the board of a medical school, the twisted “questions and answers” of popular women’s magazines…. The smug propriety of the praise showered on Munro is arguably as shallow as Ellis’ dismissal and the subsequent brainlessness of the backlash to his tweet. The bitter grain of truth in Ellis’ second tweet is that prizes, however much they materially further even a deserving writer’s career, are perhaps more revealing of literary values than of a writer’s worth. This forum now on-line at Boston Review, though a little overwhelming with its nineteen participants, is exemplary of just what we could use more of, the more varied the participants, the better! Poetry on the Brink | Boston Review. Regardless whether you agree or disagree with the “pointlessness” of Slam Poetry, the clip does express a truth, but one more general, I think, than what the blogger or the clip’s writers had in mind. For what, exactly, is the clip mocking? One way of putting it would be that Spoken Word is a generic manner, one so stereotypical it is of no more importance to what is said than an accent. However, it doesn’t take too much familiarity with contemporary poetry to realize that the same holds true for wide swaths of every school of poetic composition, whether “Official Verse Culture”, the present-day institutionalized Avant Garde, Neoformalism, or what have you. Indeed, it is precisely these characteristic, generic mannerisms around which their respective appreciative readers, reviewers, editors, publishers, and practitioners hover. The problem is not any one empty manner but schematized production—and consumption—as such, whether of poems or Big Macs. What is rightly slammed in the clip is the vapidity cultured by the need to ingratiate oneself or one’s product, cultural or otherwise. Maybe that’s why I HATE POETRY. I post below two passages from the Preface to Lacoue-Labarthe’s and Nancy’s The Literary Absolute, a study of twelve texts from the Athenaeum (Jena: 1798-1800). 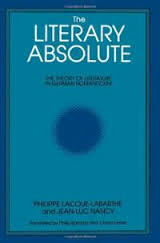 The original French version L’Absolu littéraire appeared in 1978, the English-language translation in 1988, i.e., a solid generation ago. The francophobic likely to reject the volume out of hand might be more circumspect did they know the investigation carried out by Lacoue-Labarthe and Nancy parallels the equally generally unacknowledged thinking of the German-language scholars Dieter Henrich and Manfred Frank and England’s Andrew Bowie. Those who find such matters too philosophical or overly-intellectual were already answered in the Athenaeum: “If some mystical art lovers who think of every criticism as a dissection and every dissection as a destruction of pleasure were to think logically, then ‘wow!’ would be the best criticism of the greatest works of art….”—Friedrich Schlegel, Critical Fragments, 57. A veritable romantic unconscious is discernible today, in most of the central motifs of our “modernity” [or “postmodernity”]. Not the least result of romanticism’s indefinable character is the way it has allowed this so-called modernity [or postmodernity] to use romanticism as a foil, without ever recognizing–or in order not to recognize–that it has done little more than rehash romanticism’s discoveries. …it is not difficult to arrive at the derivatives of these romantic texts, which still delimit our horizon. From the idea of a possible formalization of literature (or of cultural production in general) to the use of linguistic models (and a model based on the principle of auto-structuration of language); from an analytic approach to works based on the hypothesis of auto-engendering to the aggravation of the problematic of a subject permanently rejecting subjectivism (that of inspiration, for example, or the ineffable, or the function of the author, etc. ); from this problematic of the (speaking or writing) subject to a general theory of the historical or social subject; from a belief that the work’s conditions of production or fabrication are inscribed within it to the thesis of a dissolution of all processes of production in the abyss of the subject. In short, we ourselves are implicated in all that determines both literature as auto-critique and criticism as literature. Our own image comes back to us from the mirror of the literary absolute. And the massive truth flung back at us is that we have not left the era of the Subject. Carmine Starnino has graciously and with characteristic gusto posted a reply to my more-or-less articulate, offhand gripe on ‘criticism’ and ‘polemic’. To facilitate conversation I have perhaps imprudently replied in the comment thread to Starnino’s reply. Interested parties are therefore, to satisfy their curiosity or chip in their own two cents, referred to the post on the Véhicule Press blog here.